In scenes tracked with AE's 3D camera tracker, the ground plane of your scene often ends up as an oblique plane in 3D space. Orient World fixes this - with a single click you can turn a layer into the ground plane of your scene, and orient everything else accordingly. Or, instead of setting a ground plane, you can align your scene to walls. To tweak it even further, you can also manually move, rotate and scale your coordinate system in 3D space. 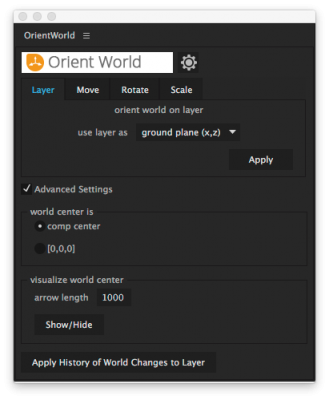 What's more, Orient World offers an intuitive visualization of the center of your world. You can turn it on or off with a single click. In contrast with the camera tracker built into After Effects, The Foundry's Camera Tracker creates a null object that all other layers are parented to. 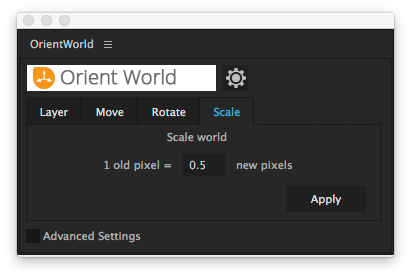 In order to make Orient World work with The Foundry's Camera Tracker, you need to delete this parent null before applying Orient World. 1.1 - option to choose world center - see this video for details. Swiss Knife is a group of 20 tools that can be combined in thousands of variations. Link texts, colors and data from your Ae project to a JSON file.